She made me cry, she done me wrong. Table's turned and now her turn to cry..
She spent all my money, playing her fast game. Table's turnin' now it's her turn to cry.. I used to wake in the morning, get my breakfast in bed. When I got worried, she would ease my aching head. "It's All Over Now" was written by Bobby Womack and Shirley Womack. It was first released by The Valentinos featuring Bobby Womack. The Valentinos version entered the Billboard Hot 100 on June 27, 1964, where it stayed on the chart for two weeks, peaking at No. 94. The Rolling Stones had their first number-one hit with this song in July 1964. The Valentinos' original version of the song was played to the Rolling Stones during their first North American tour in June 1964 by New York radio DJ Murray the K. Murray the K had an extended series of interviews with the Stones on his WINS Swinging Soiree hit radio show following his similar success as the first radio DJ in the USA to have the Beatles with him on the air (February 1964). He played the Valentinos' song to the Stones, who "raved on it" and said "it was their kind of song". He also played the Stones' "King Bee" (their Slim Harpo cover) the same night and remarked on their ability to achieve an authentic blues sound. After hearing "It's All Over Now" by the Womacks (aka the Valentinos) on the WINS show, the band recorded their version nine days later at Chess Studios in Chicago. Years later, Bobby Womack said in an interview that he had told his manager he did not want the Rolling Stones to record their version of the song, and that he had told Mick Jagger to get his own song. His manager convinced him to let the Rolling Stones record the song. Six months later on receiving the royalty check for the song he told his manager that Mick Jagger could have any song he wanted. 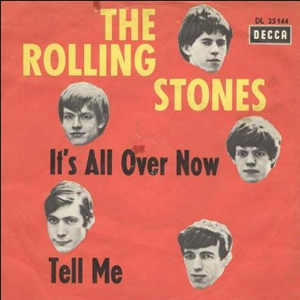 The Rolling Stones' version of "It's All Over Now" is the most famous version of the song. It was first released as a single in Great Britain, where it peaked at number 1 on the Disc Weekly charts, giving the Rolling Stones their first number one hit ever. It was the band's third single released in America, and stayed in the Billboard Hot 100 for ten weeks, peaking at number 26. Months later it appeared on their second American album 12 X 5. The song was a big hit in Europe and was part of the bands live set in the 1960s. In his 2010 autobiography, "Life", Keith Richards says that John Lennon criticized his guitar solo on this song and Richards agreed that it was not one of his best, though Bruce Springsteen and many other guitar fans rank it as one of the most inspired guitar breaks ever recorded and one that is still hard to mimic. Lennon and Springsteen were probably speaking of two different things. The most famous feature of the recording is the echoing twang played by Brian Jones. It was his own invention and not included in the original version by the Valentinos. The actual solo played by Keith Richards was much less imaginative run-through of old Chuck Berry mannerisms. Anyone can see Jones playing the crucial parts in live footage, for instance in TAMI Show in 1964 (available in YouTube).